Looking for more high-quality B2B sales leads? On this site you’ll find out how I have helped more than 100 small, medium and large companies achieve their sales and marketing goals. I’ve written more than 70 articles and free downloads to help you build your lead generation programs. Is your company doing all it can to turn B2B sales leads into sales? Get the checklist and more. If you’re responsible for B2B marketing, lead generation or sales, this monthly email newsletter is for you! 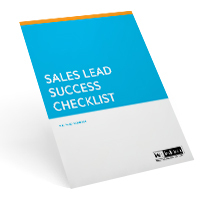 Your complimentary subscription to Sales Lead Report is a quick and easy way.